My name is Miss Amy and I started at Children Central in 1998. I have been working with children for over 20 years. I graduated from Penn State University in 1996 with a BS degree in Health Policy Administration and decided I love working with children, so I continued to pursue a Master’s degree in Education. I graduated from Holy Family University in 2002 with a Master’s Degree in Elementary Education. From 2002-2004 I substitute taught in the Neshaminy, Pennsbury and Bensalem school districts. I soon realized that my passion for children was for that of a young age. In addition to my credentials, I have had a lot of life experiences that have helped shape and mold me into the person that I am today. In 1998, I backpacked all over Western Europe for four months, living in either a tent, when safe, or in youth hostels. The experiences I gained in traveling across other countries exposed me to many other cultures and ways of life, helping me to better understand myself as well as others. Each summer, my husband, two boys and I move to the Jersey shore to enjoy two months with family and friends. We believe strongly in family and feel that we are providing our children with not only memories that will last a life time but also a sense of what it means to be a family unit. 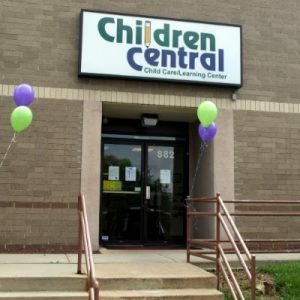 My two sons have attended Children Central. My oldest graduated the full-day kindergarten and my youngest graduated the Pre-Kindergarten class. They both started when they were 8 weeks old and there is no other place I would put my children. They have both been surrounded by so much love and nurturing while in a learning environment, and I would not have it any other way. My name is Mrs. Ali and I started at Children Central in January 2014. I am happy and excited to join the high quality staff at Children Central where I can offer caring, energetic and positive help and service to the children and staff. I love taking care of children and have a passion for helping them succeed. I raised my three children and currently enjoy taking care of my three grandchildren in my spare time. My love and passion for children guided me to volunteer at Little Learners Day Care for seven months. I also worked for five months at Greenberg Elementary Public School in Northeast Philadelphia where I assisted with the Kindergarten class and helped the students. I have earned a Bachelor’s degree in Electrical Engineering. I previously worked as an Electrical Engineer and was head of the department of planning at a woman’s clothing factory for eight years. I also was an Electronics Engineering Technician at a company in Philadelphia for twelve consecutive years. Eager to learn, I am currently a student at the Community College of Philadelphia, studying to obtain a Network and Systems Administration Proficiency Certificate. I have been married for 24 years to my husband Rasheed. My husband and I share taking care of our beautiful family, and raising our children and grandchildren to have good manners and dignity. I have a lot of expertise in the home especially when it comes to cooking, which is my favorite hobby. I love to prepare the most delicious and healthy meals for my family members. I also enjoy designing and sewing. I am positive and optimistic that working for Children Central will be another success for me, and another positive chapter to add to those that I have achieved throughout my career. Hello my name is Miss Mary Ann and I am so excited to be part of the Children Central family in the Infant Room. I was born and raised in New York, however, right after graduating in 1983 I moved to Ecuador in South America. I recently moved back to the USA with my husband and our three sons after living in Ecuador for 33 years! What an amazing experience it was to see and be part of this beautiful and captivating country, which I recommend everyone to take a visit someday. In Ecuador I worked in several places before finding my true passion – working with children. The past 13 years I taught English as a second language to children ages 3 to 6. In fact, my first group of students graduated from High School last year and they invited me to their prom and graduation! It was wonderful to see how they had all grown up to be such amazing young men and women, and to know that I was part of their development. My other passion is giving back to the community through Rotary International for 30 years together with my husband and sons, and playing an important role in our Church. I am so grateful for the opportunity to work in this wonderful environment filled with love and joy and to be surrounded by your little ones and to see them grow day by day! Hello! My name is Miss Emily. I recently graduated from East Stroudsburg University with a Bachelor’s degree in Social Work and Psychology. I started teaching children approximately four years ago, when I started as an assistant teacher for infants, toddlers, and as summer camp counselor for kindergarten age. I soon realized working with infants was one of my passions due to my high emotional intelligence and patience. I am very happy to have joined the Children Central staff as of October, 2017. From a young age I have had a desire for ‘everything food.’ Everything. My grandmother and mother passed on the love of food and cooking to me. Family gatherings have always revolved around the menu and cooking. As I come from the Irish culture, I decided to take a 2-week journey to Ireland with my boyfriend to broaden my horizons and learn about Irish cuisine. Soon after that, I realized what I really was passionate about – traveling the world while tasting new cuisines, so maybe one day I could open up my very own restaurant. I enjoy the simple things in life: being happy is a state of mind, and I do not think people should settle for less than they deserve. I am huge on honesty and respect. I love life and always take time from my busy schedule to make sure I enjoy what nature has to offer. I love sightseeing and if I am not working, I am out enjoying the fresh air and scenery. I enjoy spending time with my family and friends as I think that family is the most important aspect that life has to offer. I am so happy and excited to be an Infant Room teacher here at Children Central where I can contribute kindness, lots of love, and a positive atmosphere to your child’s life!